Makeup is a great way to disguise signs of aging and sun damage, but its use is limited to only covering up the defects. Over-the-counter products are limited in what they can improve. Medical grade creams and lotions have higher strength prescription ingredients and are great for maintenance of improved results after rejuvenating treatments, or for those who are willing to wait for slower results. For unwanted hyperpigmentation, age spots, freckles, acne, or poor texture, patients often need a professional intervention such as broadband light therapy (BBL). At Oasis Eye Face and Skin, we offer BBL photo rejuvenation to patients who are looking to regenerate skin cells and restore a smooth, younger-looking appearance. What is BBL (Broadband Light) Therapy? Broadband light (BBL) therapy uses a type of intense pulsed light (IPL) to remove unwanted blemishes from deep inside the skin. Using unique filters and wavelengths, BBL is capable of targeting specific depths and destroys certain skin problems such as brown pigment and unwanted veins and redness. This forces the body to heal itself, making collagen and elastin in the process that results in a more youthful look. BBL can also be used on the eyelids to dramatically relieve dry eye symptoms. These dry eye sufferers typically have rosacea-related blepharitis (inflammation of eyelids) or meibomian gland dysfunction (a clogging of the oil glands in the lids). BBL treatment on the eyelids should only be done by an ophthalmologist who can place laser shields under the eyelids and apply a precise treatment in order to avoid eye or lash injury. 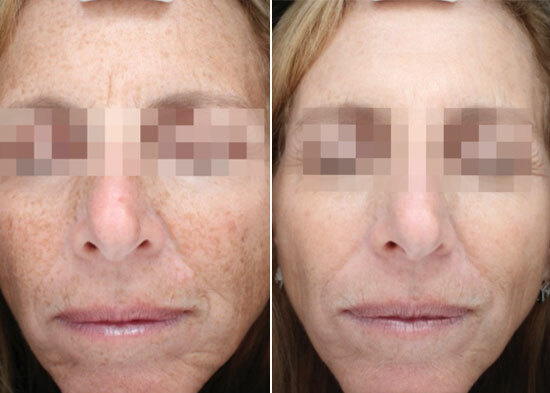 BBL photo rejuvenation, or photofacial, is a well-tolerated treatment with virtually no downtime. It can be used on the face to promote the production of collagen and elastin. BBL uses different filters to pick the wavelengths necessary to achieve the desired results. Having the ability to select the right wavelengths allows the operator to target specific structures, such as pigment and blood vessels. The filters can also be swapped easily, which makes it possible to quickly treat various skin conditions in the same treatment session. Once skin flaws have been corrected, Forever Young BBL should be used for maintenance. The light energy helps to stimulate collagen growth, which in turn helps to maintain healthy skin and prevents future signs of aging. Forever Young BBL keeps your skin glowing and looking amazing when repeated 3 times per year. What is the Difference between BBL And Laser Therapy? Although both treatment therapies can be used to treat similar skin conditions, BBL and IPL should not be confused with laser therapy. Lasers use a single wavelength to destroy the target structure, such as melanin (brown pigment) or oxyhemoglobin (in blood vessels). Broadband light and other intense pulsed light modalities don’t just focus on one specific target, but instead allow overall facial rejuvenation. Treating the skin with broad-spectrum light provides versatility, which has made this type of treatment very popular. Further popularity is garnered by the fact that it has virtually no downtime, which can’t be said about some laser treatments. The procedure for BBL is non-surgical and very well tolerated. A topical anesthetic can be applied beforehand to ensure complete comfort and special eyewear will be provided to protect the eyes from the light. During treatment, a cooling sapphire crystal is placed on the skin to prevent any possible burns. The light therapy session is quick and can usually be completed in less than 30 minutes for the face. Patients are free to return to their regularly scheduled day immediately after treatment, as the broadband light does not damage the outside surface skin, but one should avoid sun exposure for the following 2 weeks. You may experience some slight redness, but that will dissipate in a few hours. Sunscreen and makeup can be applied after your treatment to cover up any possible redness or swelling. There is no real downtime and skin improvement can be noticed right away. The pigment will lift off within a few weeks, and smaller blood vessels will disappear faster than larger ones. Achieving full results may require two to five sessions to remove reds and browns. Final results include a dramatic change in color, tone, brightness, and texture of your skin. Even though BBL and other IPL treatments are not a laser, the light is very intense. This means that medical professionals using this device require in-depth training, understanding, and experience to avoid complications such as unwanted pigmentation, burns, or scarring. Board-certified oculofacial plastic surgeon Dr. Vivian Schiedler has extensive training and experience using broadband light and Forever Young BBL therapy. She can ensure all precautions are taken to safely treat the delicate areas around the eyes while maximizing results. There have been two scientific studies on BBL that show just how effective it is for facial rejuvenation. One study from Stanford University Dermatology Department in 20131 showed that regular treatments with BBL two to four times a year could make your skin regain its youthful characteristics and halt further aging. BBL treatments were used to turn on over 1,900 skin genes that had been turned off due to skin aging. This change made older skin look more youthful thanks to the increase in collagen production. A second clinical study2 conducted at Stanford between 2004 and 2013 also showed that regular treatment with BBL had a significant anti-aging effect. Two to four yearly treatments were given, and at the end of the nine-year study the patients did not look any older. They either looked younger or the same as they did when they began the study. It was concluded that regular treatments with broadband light significantly slows down the skin’s aging process. Both of these studies were performed with Sciton’s BBL device by dermatologist Patrick Bitter, Jr, MD. Dr. Schiedler has learned directly from Dr. Bitter how to maximize results and safety. Chang A, Bitter PH, et al., Rejuvenation of Gene Expression Pattern of Aged Human Skin by Broadband Light Treatment: A Pilot Study. Journal of Investigative Dermatology, 2013, 133, 394-402. Bitter P, Pozner J., Retrospective Evaluation of the Long-term Antiaging Effects of Broadband Light Therapy. Cosmetic Dermatology, February 2013, 34-40. Don’t let visible signs of aging cause you to become discouraged. You can’t control how you age, but thanks to Forever Young BBL photo rejuvenation you can control how your skin looks. Get the younger-looking skin you desire with no surgery or downtime. Come meet with Dr. Schiedler at Oasis Eye Face and Skin to see if you are a good candidate for BBL. Contact us today by calling 541-500-0165. Please call (541) 500-0165 today or fill out the contact form below and we'll be in touch. Oasis Eye Face and Skin was founded by Dr. Vivian Schiedler, a board-certified and fellowship-trained oculoplastic surgeon. Specializing in both surgical and non-surgical treatments for the eyes and face, Oasis Eye Face and Skin proudly serves the communities of Ashland, Medford, Grants Pass, and southern Oregon. * Individual results may vary. Please call to schedule a consultation.